Tomorrow night is the opening reception for Living With Endangered Languages in the Information Age! 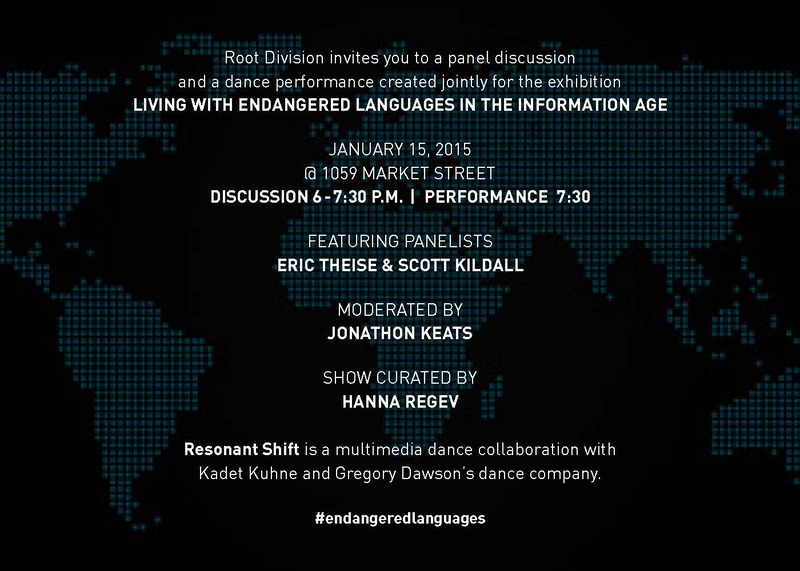 We are also having a panel discussion centering around the role of technology in Languages and Art on the 15th. Please join us! I am gathering endangered words for an artwork and I need speakers of endangered languages to participate in my project. I have been invited to be part of an exhibition on Endangered Languages curated by Hanna Regev which will begin at Root Division in San Francisco. I need to collect audio samples of certain words in endangered languages for the piece I will include in the show. There is a physical element to the work, but the text and the sound of each language are essential to it. I am looking for words that say something that isn’t easily translatable into more commonly spoken languages, possibly words that hints at the culture. For example: “tattybogle” is a lovely Scotts word (a language on the endangered list) but it directly translates into the English “scarecrow” so I would not count it. The word “tingo” (Pascuense , Easter Island) is better. On Altalang.com it is translated as “the act of taking objects one desires from the house of a friend by gradually borrowing all of them.” This is a word which gives you a window into a culture that would produce such a word and takes a clever sentence to translate into a more commonly spoken language. What I need for my work is words like that from Endangered languages, spoken and explained on audio by speakers of those languages. Amazingly I’m already finding a fair few… on the internet. Mostly at this point it is friends of friends, but I hope to expand. If you speak an endangered language and would like to be part of the piece, please contact me at contact@marymarch.com with the subject heading “endangered languages”. One component of the show is the effect of technology on languages. Are dominant Languages like English, Mandarin and Spanish just taking over because of media and the internet or does the internet create opportunities to connect and encourage speakers of endangered languages? My thought is probably both, but I am finding that the internet is fantastic for connecting with people who speak endangered languages- something that may itself become part of the piece. UPDATE (12/1): I am still collecting Audio samples through the end of November. Please contact me if you can contribute. You may remain anonymous in the public project information if you like. It’s basically a 15-30min Skype, Google Hangouts or Facetime call (which you can turn the video part of off) where I record the word or phrase, your translation and a personal thought or story about them. To see if a language you speak is on the endangered list see Wikipedia’s Lists of Endangered Languages by area. The United Nations has an interactive map of endangered languages here. 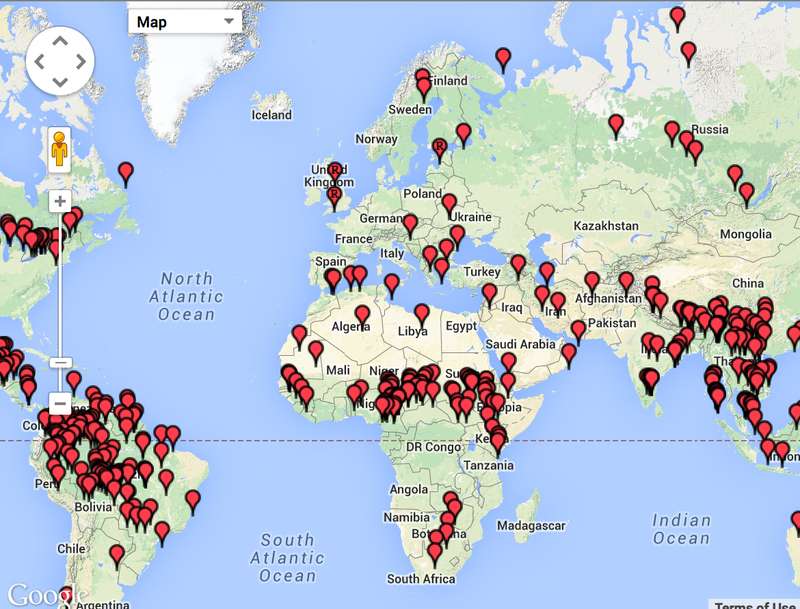 Another great interactive map is here on the Endangered Languages Project site. For more information on me and my work as an artist, see my website at www.marymarch.com (I suggest the installation and “About the Artist sections in this case).